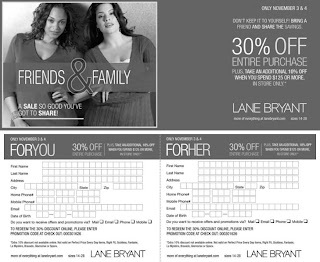 Friends and family sale at Lane Bryant today and tomorrow at the 7 W. 34th Street store. This means 30% off your entire purchase, check out the coupon below for more information. Luckily you don't even have to print it up to enjoy the savings (more $ for clothes, less $ for stupid expensive toner cartridges) just visit and shop. I'd look for the peacock blue Baby Phat cowl-neck sweater for $84. Yes, there is a "cascade of foil cat logos" but this is pretty, not overdone, and it's cotton/spandex, that durable and comfortable blend. From the Lane Bryant line I like the houndstooth knit jacket with the belt (gives full figures a nice shape), $59.50, and the cowl-neck sweater vest for $39.50. It's all about the vest this winter. And for something special try on the silver jacquard jacket for $79.50 as it could be a perfect holiday party staple. All these prices are before Lane Bryant rewards you for being such a good friend or family. Also, Malo's sample sale at Soiffer Haskin begins this Sunday. Drop by after the marathon and get 70% off retail for their women's and men's knitwear. This Italian sportswear company is known for its super-luxe cashmere and cashmere, cotton and silk blends. Sunday - Tuesday, 9am - 6:30pm, Wed., 9am - 5pm. It's credit cards only, all sales final, and leave the kids (under 12) and strollers at home. I guess a stroller would give you an unfair advantage at a sample sale. Makes sense as they are often used steam-roller-like on NYC streets.